I am writing this post as a tribute to a very dear friend of mine with whom I share a profound appreciation for fabrics, in general, and silk in particular, and who has become an integral part of my life. "Inrō" is a traditional Japanese case for holding small objects (traditional Japanese garments lacked pockets); they are comprised of several boxes stacked on top of each other with the help of a cord, which also serves to secure the "inrō" to the "obi" (or sash). Most types of these "sagemono" were created for specialized contents, such as tobacco, pipes, writing brush and ink, but "inrō" were suited for carrying anything small, often times identity seals and medicines. "Kimono" is a Japanese traditional garment (the word literally means a "thing to wear", from "ki" - "to wear" - and "mono" - "thing"). Both "inrō" and "kimono" evolved over time from strictly utilitarian articles into objects of high art and immense craftsmanship. Hermes is paying tribute, as from a master artisan to the creations of other artisans, to the artform that "inrō" and "kimono" entails and represents. 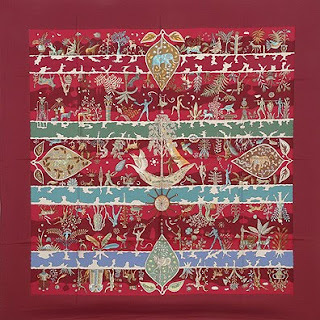 This scarf is set to appeal to all admirers of Japanese art, manifested in its many forms. The colours of this particular scarf are a little subdued, but I chose it not only because the green is yet another colour that my friend and I like and have embraced, but also because the hue allows the depicted Japanese objects to display in all of their glory. Whenever I see this design, I will think of her, and if one day I'll have the fortune of owning one, she'll be with me not only emotionally, but also in a very tangible way. This design was created by Annie Faivre, in the service of Hermes for over 30 years (her nickname, given to her by family and close friends, is "little monkey", so over the years, she has been incorporating a little monkey in most designs - this one is the only one, to my knowledge, not to contain the monkey illustration). Living in Paris, she is now a grandmother and continues to create designs for the Maison, some of them quite impactful. I wrote, last week, about this design, yet this is an exceptional colour combination that deserves a separate mention. "Rives fertiles" ("fertile rivers") pays tribute to the River Nile and the countless lives it enriches as it carves its way to the Mediterranean (proof of the Egyptian reference is the pyramid in the lower right hand corner of the design. The designer, Christine Henry, has already made her mark with many other intricate and very detailed patterns, but this one remains one of my all-time-favourite. Note that the style is similar to the post of two weeks ago - the same attention to detail, the same delicate drawings as in "people du vent" - yet while the former has a distinct East European folkloric motif, this one elevates beyond cultures to become a timeless masterpiece. 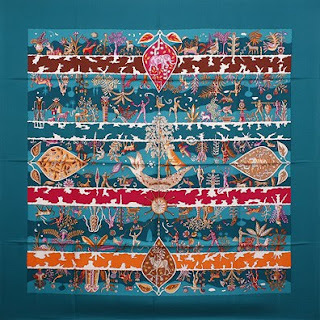 It ties beautifully and the colours are simply sublime (the marine border reminds me of the deep colours of the Black Sea waters while the hues of burgundy, dark orange and pink are warm and soothing). The kind of scarf that not only tells a story, but is worthy of a magnificent frame and a prominent display. Continuing the stream within the Hermes collection, "Rives Fertiles" ("Fertile Rivers") follows the course of a water stream - or perhaps of several, revealing the impact water has on the people who have access to it. It reminds me of the river Nile, and the history lessons I used to enjoy so much in high school, when we learnt about the two harvests triggered by the unusually fertile Egyptian land "bathed" by the river Nile. This particular colour combination is quite an accomplished and enchanting visual symphony, with an air of elegance and sophistication that few scarves manage to attain. 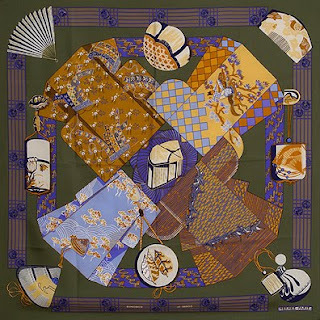 I'm taking a trip back in time to feature some of the more impactful scarves of 2005 - when Hermes paid tribute to the source of all life (water) by dedicating its entire collection to celebrating it. 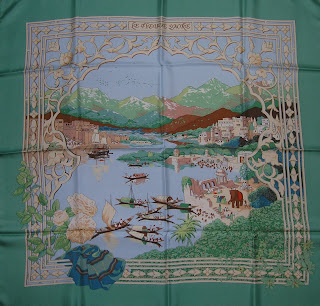 This scarf is a rendition of a scene of Indian life as it unfolds along the shores of the sacred river Ganges. My appreciation for this scarf stems from the acknowledgement of the tremendous impact to a civilization that water - or access to it - has had throughout the human history. The human existence has been determined - and influenced - by a stream of water, and this principle holds true today as it did centuries ago (the global warming effect, felt throughout the world, has many nations worried that it would result in less access to potable water; Canada, fortunately, is part of a select few countries that enjoy tremendous reserves of freshwater). The Ganges river, some 2,500 km long, rises in the Western Himalayas (in the Indian state of Uttarakhand) and flows East, draining into the Sunderabans Delta in the Bay of Bengal. Jawaharlal Nehru, a leading figure in the Indian independence movement and the first - and to date longest-serving - prime-minister of India, described the significance of the River Ganges in his "Discovery of India" as follows: "The Ganges, above all, is the river of India, which has held India's heart captive and drawn uncounted millions to her banks since the dawn of history. The story of the Ganges, from her sources to the sea, from old times to new, is the story of India's civilization and culture, of the rise and fall of empires, of great and proud cities, of the adventures of man...". "Le fleuve sacré" ("the sacred river" - The Hindus consider Ganges a holy river and worship it as the Hindi Goddess Ganga) - is an ode to the enriching effect of the river Ganges on countless lives (the river supports one of the world's highest density of humans). 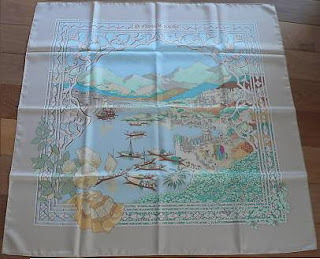 Designed by Catherine Baschet and issued in 2005 as part of the "Rivers" theme, the scarf beautifully depicts the four pillars of human existence - the people's livelihood (as represented by the dwellings, by the folks bathing in the river as well as by the vegetation and animals), the economic activity (the trade is suggested by the ship and the sailing boats) and the social aspect (the interactions on the river's shores) are powerful symbols of how life can flourish on the shores of a rich river. The overall scene, perceived through an apparent window in the style of, and richly ornate with, Indian motifs, defines the folks' cultural accomplishments. Many of the colours combinations are either bright or too subdued, yet I find the ones featured in this post among the - if not "the" - most impactful and beautiful.